Earlier this year a customer of ours contacted us, frustrated with the performance of their existing kiln cart bushings. The carts were very difficult to move – so much so that motorized equipment was being used to pull and push them through the kiln. Our solution was a new bushing made of a proprietary cast nylon with selected fillers for kiln wheel bushing applications and an added safety yellow color (to avoid confusion with the existing blue nylon bushings). These bushings performed beyond expectations – the kiln carts now move so freely through the kiln that the only problem is stopping them! Our improved kiln cart bushing is now in use at multiple mills on the Pacific coast and the feedback has been extremely positive. 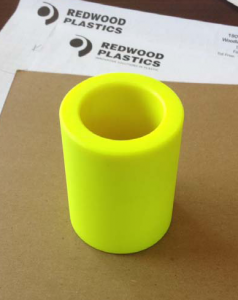 These bushings are yet another example of the type of innovative industrial plastic solution Redwood Plastics can supply.